A couple weeks ago, S and I crossed another restaurant off of our A-List Challenge. This time it was Balaton, which is located on Shaker Square, and serves Hungarian and central European cuisine. We arrived shortly after they opened on a Saturday afternoon, and were the only ones there, so we had the place to ourselves for a few minutes. My first impression was that this place was not at all into the trendy chic like some of the other places we’ve been recently. This is definitely more of a family, homestyle, Old World restaurant, from the pictures on the walls to the music, which was some kind of mix of 80s hits and New Age (interesting, and kind of amusing, to say the least). But, while some restaurants rely on staying trendy, some get by on food alone, and this is clearly one of those. They’ve been open since the 60s, and if I were to guess, I’d say it probably looks remarkably similar to when it first opened. Of course, they weren’t playing 80s hits in the 60s, but the decor is probably much the same. We were started off with salad and bread, which was warm and chewy. 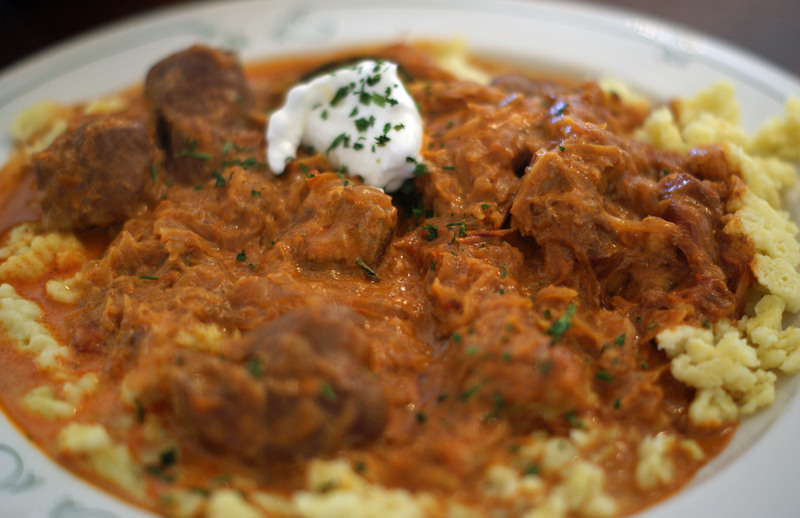 I ordered the Szekely Goulash, which combined pork tips and sauerkraut, topped with a sour cream sauce, and all served over homemade spaetzle (most everything on the menu comes with the spaetzle). The sauce was a little on the salty side for my taste, but the pork was fall-apart tender, and paired perfectly with the sauerkraut. 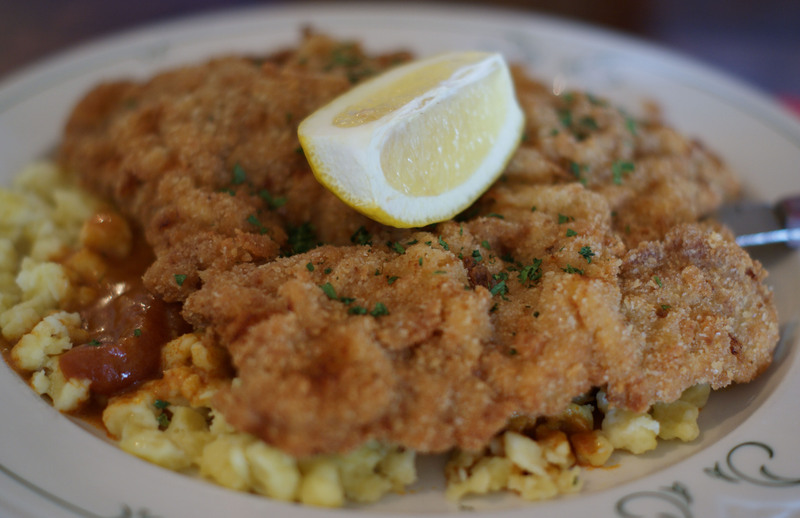 S had the wiener schnitzel, which is supposedly their most well-known dish, and I can see why. It was thin and tender, and not overly greasy, as this dish can sometimes get. Again, simple but done near perfectly. And for dessert – they have a sizeable dessert menu (including lots of crepes and tortes, many with ground chestnuts, which is not common among most dessert menus we see), but we ended up choosing a Chestnut Cream Torte – several layers of walnut cake, intermixed with chestnut cream and a few dollops of whipped cream. 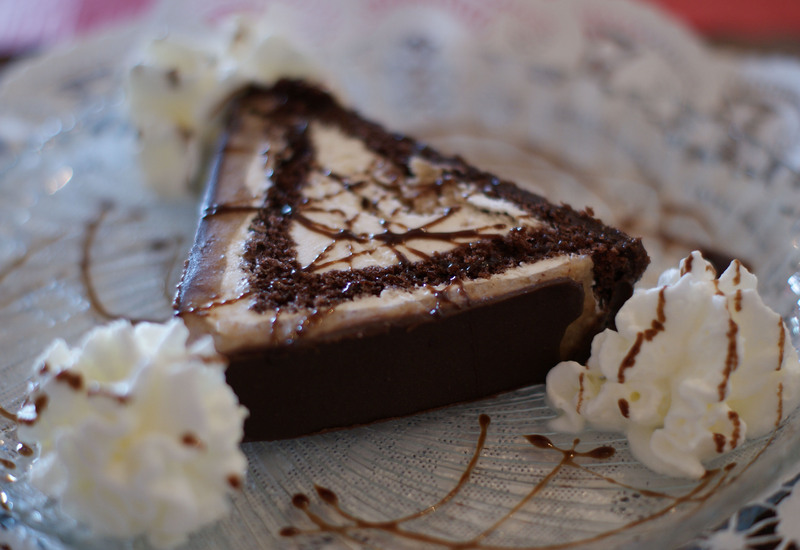 The cake was moist and not overly dense, the cream was creamy, and the flavors were super. All in all, another fine selection. As long as you know what to expect, and you’re not looking for something flashy, but just good homestyle food, you can’t go wrong. One word of advice – get the small portion. Many dishes are offered in small and regular, and since we were heading to a party later that evening, we got the small portions, which were plenty big, even for me (and a couple dollars cheaper). Service was good, prices were reasonable (about $35 for the two of us, including dessert), and the food was good Hungarian staples. I make that pork goulash in the winter, when we have lots of canned sauerkraut in the cellar. Also sometimes with beef. YUM.